Purified Air Conditioning Inc has been in business since 2005. 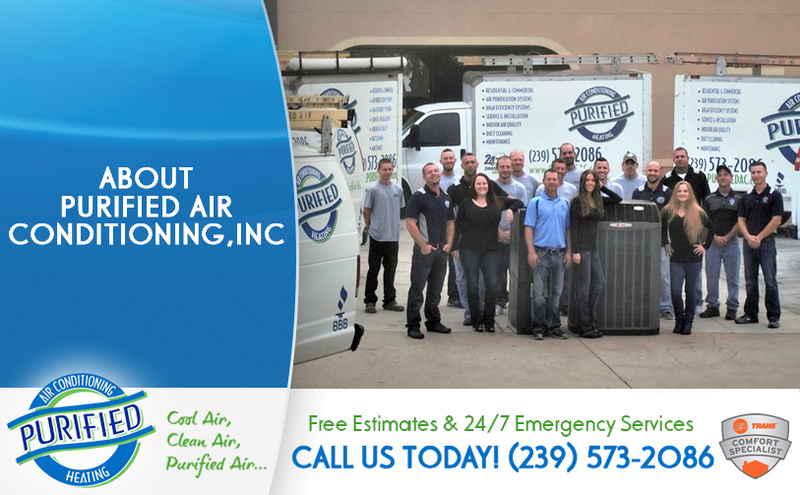 Its proudly owned by husband and wife, who together hold the license in house along with 28+ years in the HVAC industry. Starting out working for a few of the many contractors in our area, a pattern immerged among them all of not only how the customers were being treated, but how they responded to this treatment. Knowing whole heartily that this wasn't how it had to be nor should it be, they set out to set a new standard in the industry and changed the way people view doing business with their AC contractor. They knew the two main things everyone hates were the high bills they were getting and just the whole experience of dealing with the company itself. From those two things, we've coined what we call, "THE PURIFIED EXPERIENCE". Our family of employees are out to be the most informative, polite, helpful, and understanding in the field. We want our customers to not only understand what is causing their issues, if any, but to also know how to prevent future problems and minimize their outgoing money on their air conditioners. Nobody enjoys unexpected expenses, especially when they don't understand why they're spending the money. With that alongside the pressure of it being a must have, air conditioning naturally can be intimidating to say the least. It doesn't have to be that way! We believe that in conducting business in this manner, we can change the fear of dealing with air conditioning repairs & maintenance, and purify the experience. Call us today and experience the difference for yourself.